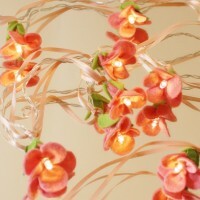 These pretty and delicate Rose Fairy Lights are handmade from felts with satin ribbons. They are so pretty at night and are perfect as a wedding present, new home present or lovely Birthday gift. - The 10 roses are made from pale pink felts with green felt leaves and double satin pink ribbons are twisted around the clear wire of the lights. - Fairy lights are LED and battery powered which means they can be hung anywhere without a need for a power socket or worries about cables being in reach of children. They are entirely safe as do not heat up. - The 10 LED lights are on a clear cable measuring measuring 1m 26cm and require 2 AA batteries (not supplied). - The lights have a ribbon loop at either end for easy hanging and the entire length measures 1m 70cm. These lights are available in pink, red, pale blue and lilac. They can be made in any colour so please contact us to discuss further. Processing prior to shipping will be 4-5 business days as each item is custom made. Please feel free to contact us directly for 'rush' orders. The lights are carefully packaged, wrapped with a ribbon and sticker and therefore ready to give as a beautiful gift. Button Owl custom makes felt and material artwork, so please contact us with any requests for colour changes or for a quote for individual commissions. All Button Owl items are made to order, allowing all customers the possibility of customisation and personalisation of products. Items will be shipped within 4-5 business days of receiving an order and longer for items with detailed customisation. If you need your order urgently, please get in touch and we'll try our best to get the order out to you as soon as possible. Every item will be carefully and securely packaged and sent via Royal Mail unless otherwise requested. All items can be shipped internationally so please get in touch to arrange delivery outside the UK. Personalised or customised order items are non refundable. Please ensure you select the correct details and personalisation before placing your order. All designs are copyright of Button Owl. Our personalised items are non returnable, so please make sure the correct personalisation or colour is detailed. All standard items are returnable under the distance selling regulation and must be returned within 7 day in their original packaging and in their original condition. Please contact us to let us know why you are returning. Shipping charges are non-refundable and are full responsibility of customer. Your refund will be issued when return items are received.